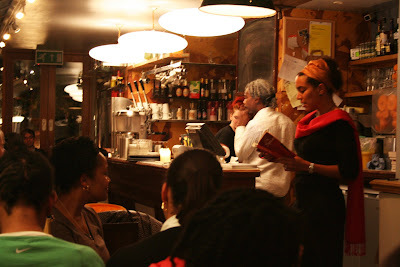 naijablog: Sarah Ladipo Manyika reads from In Dependence..
.. at the Blue Mountain Cafe (lovely place) in East Dulwich, last night. I love your blog, im waiting to read your next post, check out mine. I agree with you red eyes although I dont admire this woman, I hope to visit this cafe in the nearby future! I don't know if you know that the word "self-destroyed" is misspelled in your blog heading. Just to let you know.